Tony Blair will have to overcome a newly influential leftwing in the Commons as he battles to legislate for identity cards, welfare reform and tightening of asylum laws, as he returns to power today with a reduced majority…Even with a majority of around 80 it takes only 40 Labour MPs to rebel, a commonplace in the second parliament, for the legislation to be thrown out. If the prime minister had had a smaller majority in the last parliament, according to the academic Philip Cowley, who monitors parliamentary revolts, Mr Blair would not have been able to push through university top-up fees (Labour rebellion 72) or foundation hospitals (rebellion 65). A fear of being held hostage by the Labour left in 1997 was one of the factors that prompted Mr Blair to have lengthy discussions about cooperation with the then Liberal Democrat leader, Paddy Ashdown. 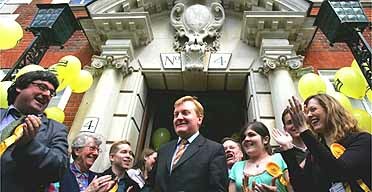 In the new parliament the option of a Lib Dem safety net, courtesy of Charles Kennedy, is not available.